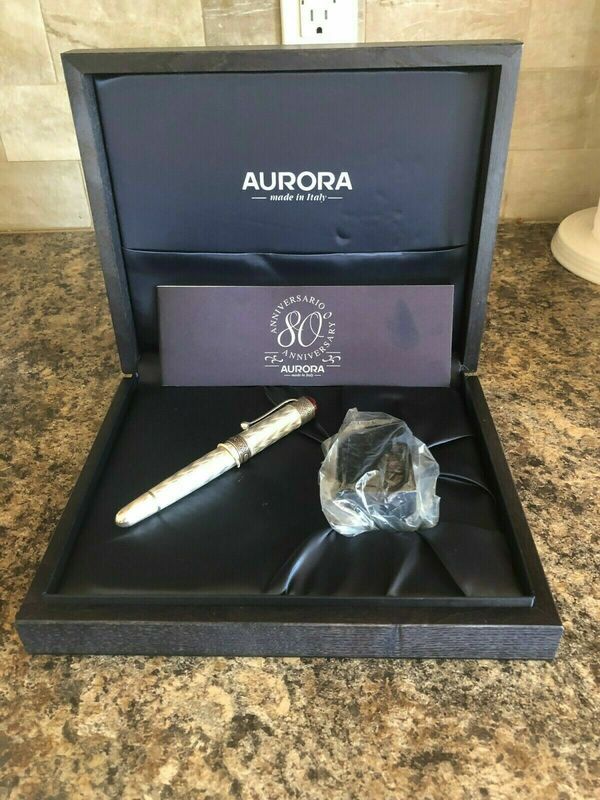 The Aurora 80th Anniversary Limited Sterling Silver Fountain Pen. Never used. Mint condition. MINT CONDITION. Never Used or Inked. Pen #849 of 1793. Comes in original presentation box with instruction manual and certificate. $1,500 or best offer. Selling off a private collection so looking to sell as quickly as possible. 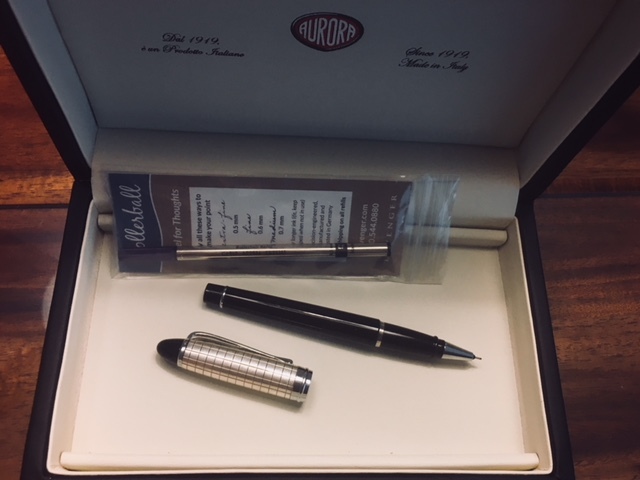 Celebrate the 150th anniversary of Italy's unification with this 3-pen set from Aurora. It includes a fountain pen, ballpoint and rollerball that are in the colors of Italy's flag. Click the headline to see the nib! This set appears to be mint and new old stock that comes complete with its boxes and papers. The fountain pen uses a standard international cartridge or converter. Glinting off the rotating light, blue flecks reflect myriad hues and richness of color that are sure to astound. 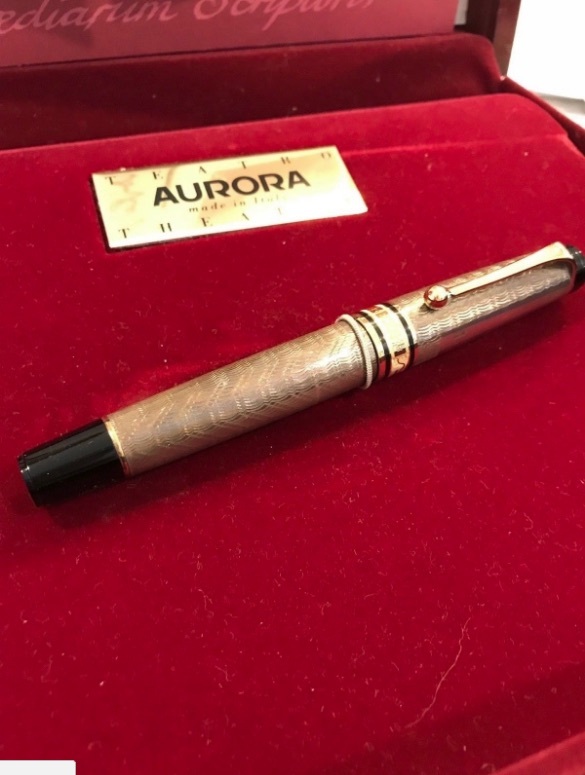 Aurora Optima luxury rollerball pens are sure to please, as the Italian artisans who make them do such incredible work. Although it doesn't come with its box, it looks almost brand new. Minimal wear. It uses easily found rollerball replacement refills, and we will include a fresh one with your purchase. The refill is loaded through the blind tail cap. 12.7cm capped. Good quality pen. Used. Cap fully functioning. Orginal cost 179.99 selling for $100. The price is negotiable, and exchanging this pen for another is an option. Write with color and class when you pick up a periwinkle Aurora Talentum ballpoint pen. It is solidly built with elegant Italian design. The pen has just enough weight to give your fingers a little momentum once you start scribbling away. It uses Parker-style refills, and comes preloaded with one...although we have no idea how much ink is left. It has only the lightest of wear, and no one will see it as you sit across from them. The refill advances and retreats with a twist of the tail cap. 13.4cm. Ever see those old photo portraits of jazz stars where the cigarette smoke was captured so beautifully? That's what the undulating waves of grey celluloid look like to me as they go from pearl grey to a deep rich grey. The silver-colored trim is ideal for its coloring, and the textured nose cone helps provide a little more grip. The Parker-style refill extends and retracts with a twist of the tail cap. It is a little larger than most Aurora ballpoints, and it is a little easier to grip, as a result. The refill works great, but we don't know how much ink remains. 13.6cm.